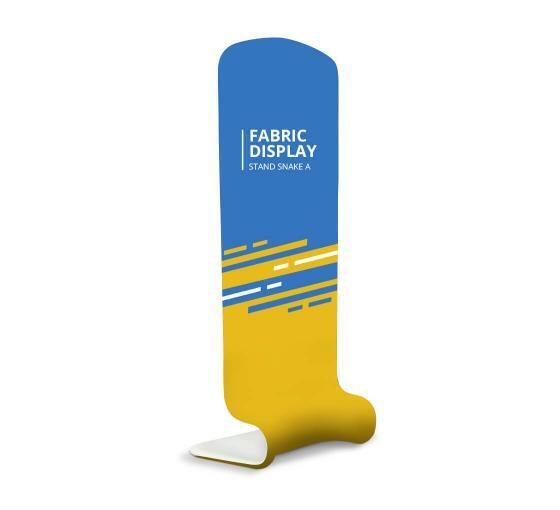 This S-shaped fabric banner stand is a new piece of exhibition equipment that is environmentally friendly and scent-free. What makes it stand out is that our pictures on the screen are riotously colorful, because dye sublimation ink is employed in printing. The frames are made of aluminum, which makes the Snake B fabric banner stand a lightweight option. It expands with ease and is set up within minutes. As it is unique-shaped and good-tailored, the fabric display stand is very eye-catching in the trade show. With your logos and slogans printed on it, the fabric trade show banner stand creates a good promoting effect which makes your customers resonate with your advertising in seconds. As S-shape fabric trade show display allows more graphical freedom, our designers can create a variety of imagery effects by using different fabrics and printing methods. And the dimensional element almost can be placed at any places of the trade show, in the middle, left or right. An S-shaped trade show banner stand is also of high reusability and one frame can be used for many times as long as you have many suitable-sized fabric graphics. The fabric graphics are also washable and lasting for future use. The economic pop up display features various designs and fashion outlook with great individuality; we have a wide range of types for you to choose to match your brand aesthetic. Want to enliven your promotional booth and make your display eye-catching? Then try unique-shaped and good-tailored fabric display stand.